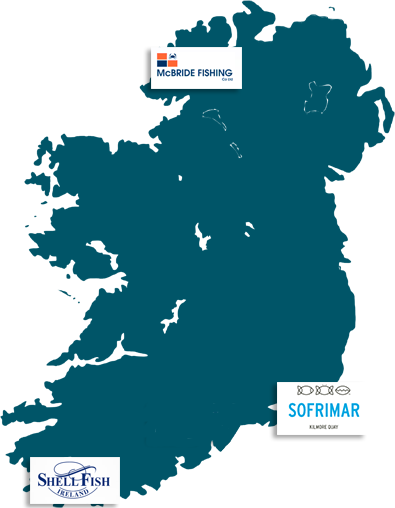 Sofrimar was established in 1979 to harness the abundant supply of shellfish and whitefish landed at Kilmore Quay. Located minutes from the harbour, Sofrimar works with the local fishing community to bring Pure and Natural Seafood to markets worldwide. With unique access to a diverse range of produce, some 90% of the business is in shellfish – whelk, scallops, crab, lobster, langoustines, razor clams and winkles – with the balance in whitefish, including monkfish and ray. Shellfish De La Mer Ltd was founded in 1987. The company operates from Castletownbere in the South West coast of Ireland with its own fleet of fishing vessels and supports the wider fishing communities in South and West coast. Situated near the richest fishing grounds, the company has access to an abundant supply of Crab, Shrimp, prawns and whitefish. From this resource we can supply our customers with the best quality seafood available. McBride Fishing Co. Limited is a premium Irish company specialising in catching and supplying crab (cancer pagurus) to both domestic and international markets. This family run business is a recognised leader in its field whose name is synonymous with both excellence and quality.